It seems like many of us have a love hate relationship with our skin. One day it’s the best and the next you have a breakout. Or maybe your skin doesn’t look as young as it used to and you’re looking for the best skin care tips out there. Well whatever your case, there are plenty of solutions to fix your problem (or at least a good extent of your problem). I know that skin beauty is a huge things for many of my readers (or pretty much everyone), so I decided I’d search for some awesome skin care tips and hacks to get you on the path to beautiful skin. I mean there are a lot of ideas and suggestions out there, but a lot of them don’t do anything for you, which is why I thought it was important to go through the skin care tips out there and see what really worked. 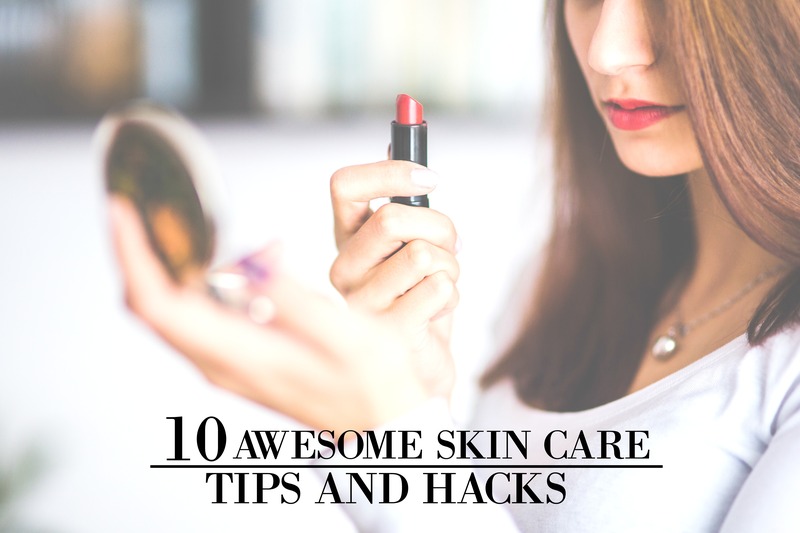 Now along with each of the 10 skin care tips, are the lists I found them from (just in case you want to read on more beauty hacks). I wanted to give credit where credit was due, but I thought you guys would like the option of being able to check out the rest of the tips the lists have. So I hope you all are able to find what works for you and gives you the best skin. Now the post itself gives more information on how to best take care of your skin, but I really thought this infographic was handy. It gives you a quick rundown on what you should do every day, week, month, and year. When things are broken down like that, it makes it seem so much more manageable. Check out the rest of Good Housekeeping’s skin care tips here! Face masks are the best, especially when they’re only two ingredients. And when it comes to this list, I like this one the best! Coconut Oil and Turmeric: Both ingredients are great for moisturizing and killing off bacteria which can cause acne. They also help keep your skin more youthful and glowing and fight off the wrinkles that form over time. Take a look at the rest of The Indian Spot’s skin care tips and masks here! Honey and Lemon Juice Mask: Both are amazing bacteria fighters that ward off acne, but they also lighten your skin of any scars or aging spots. So whether you’re trying to fight off pimples or get that stubborn scar to leave, the honey and lemon juice mask is a great option. Check out the rest of The Indian Spot’s masks and skin care tips here! I love this infographic because it’s an easy to follow guide on how to take care of your skin when washing, putting on makeup, taking vitamins, and even dieting. But what I love the best is when they talk about using products with..
Green Tea Extract: Green tea is strong in antioxidants which helps to fight against free radicals (skin aging factors). It also helps to reduce dark circles and tighten skin.. which are both pretty awesome. Check out the rest of Makeup Tutorials’ awesome masks and skin care tips here! This infographic also provides great tips, but the one I really appreciate is.. Apply eye cream or serum to prevent collagen damage: The skin around your eyes is so delicate. You have to make sure that you take care of it very well and handle it gently so the elasticity doesn’t wear out (also, if you don’t know already, your ring fingers are your most gentle fingers to use when touching your eye area). Check out more of Gurl’s skin care tips here! You use pore strips? Yeah, those things are pretty expensive. But that’s alright because you can make your own at home and save money! Use unflavored gelatin and milk for an inexpensive pore strip! All you need is 1 tablespoon of unflavored gelatin and 1 ½-2 tablespoons of milk. Mix it up quickly and pop it in the microwave for 10-15 seconds. Lastly put it on your face quick before it hardens and keep it on for around 15 minutes and then peel. Recipes found here! Check out the rest of One Crazy House’s skin care tips here! Now this graph gives some great info on more 2 ingredient masks, but the one I like best is the..
Coffee ground and egg mask: Coffee grounds lightly exfoliate while reducing redness (inflammation) and fights aging. The egg reduces swelling or puffiness (which is great for the bags under your eyes) and temporarily tightens and tones your skin. Check out the rest of the skin care tips from Buzzfeed here! Now this post is chock full of beauty tips, but I really like their tips on using..
Apple cider vinegar for dark spots and acne: this ingredient is great to keep around in your bathroom (not just the kitchen) for lightening the dark spots on your skin as well as killing off bacteria that would cause acne. Check out the rest of Makeup Tutorials’ skin care tips here! Some products are great, but many of us would rather opt for a more natural approach which is why I like..
Face yoga: face smoothing with fingers is shown to help with aging by working out the layers of your skin. So instead of botox, try gently rubbing your facial skin for 20 minutes a day. Read more skin care tips from Visualistan here! Sleep is so important for your mental and physical health, but when it comes to skin health, I really love this reason. Check out the rest of Beauty Tidbit’s skin care tips here! There are lots of things we can do to prevent skin aging and damage, in fact, there are too many. But when we know and practice just a few, we can be sure to see some awesome results. Now I hope you find some awesome skin care tips and hacks and if you have any yourself, let me know in the comments below! I’d love to hear them! Beauty goes farther than being just skin deep. Yet our skin is one of the most visible expressions of this beauty. Thanks for sharing these secrets .